Thiry-five years ago, Jerry and Judith Wilcox researched and wrote the"First History of West Islip." 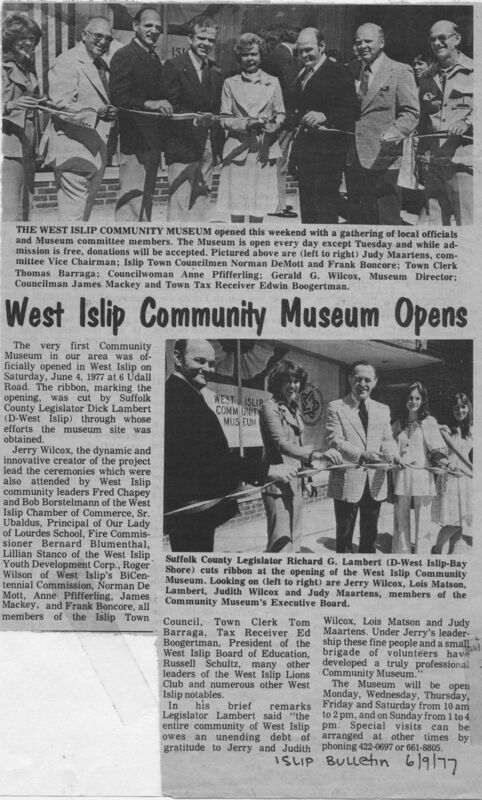 They were ardent local historians and also founded the now-closed West Islip Community Museum, which was housed in the Community Center on Higbie Lane. Their children have given us permission to post a digital version of this book which will can be downloaded to your own computer. Part 1 Part 2 It also can be found on the West Islip Library's website. The old Weeks - Muncy Cemetery on Boulevard Avenue will soon have a new fence and sign, thanks to the Town of Islip, and Historian Robert Finnegan. On Memorial Day, flags were placed on the grave of Revolutionary War soldier David Ruland, buried here. Listen to (or read) interviews conducted with West Islip residents who described life in our community back in the early 1900s... They took part in the Library's 1982 Oral History Project. Watch for news of more local history items as we work toward setting up the West Islip History Center in the newly restored LaGrange building.